Here is an excerpt from Kevin Vanhoozer on the importance of the imagination in the growth of the Christian. First, I find that the imagination is a vital ingredient in my sanctification. I need to keep the big biblical picture (creation-fall-redemption-consummation) in mind as I attempt to live day by day, minute by minute, as a follower of Jesus Christ who desires above all to have one’s thought and life correspond to the gospel. To do that, I have to keep the gospel story (together with its presuppositions and implications) in mind, and I have to connect my story to that of Jesus. That requires imagination. Second, the imagination is “sanctified” because it is “set apart” for the purpose of making just these kinds of connections. There are vain imaginings, of course. These tend to be the ones that encourage us to see our lives as part of some other picture where God is either absent or other than the Father of Jesus Christ. As for practical helps for cultivating a sanctified imagination, let me mention two. First, reading. Reading is the way we learn to inhabit the world. Not the natural world, but the cultural world: the world of meaning. Martha Nussbaum has some wonderful essays in her book Love’s Knowledge on how the novels of Henry James train us to attend to the moral significance of the details of human life. If we can learn moral sensitivity from Henry James, how much more can Christians learn, say, about speech ethics from the epistle of James, not to mention all the Old Testament narratives, Jesus’ parables, and the Gospels themselves. My concern is that many Evangelicals are suffering from malnourished imaginations. This impedes their ability to live coherently in the world—that is, according to a meaningful metanarrative. We want to believe the Bible, but we are unable to see our world in biblical terms. That leads to a fatal disconnect between our belief-system and our behavior, our faith and our life. If faith’s influence is waning, as two-thirds of Americans now think, I believe that it is largely because of a failure of the evangelical imagination. The second way I exercise my biblically rooted, theologically formed imagination is by viewing myself as part of the ongoing action that the Bible recounts. My task as a disciple of Jesus Christ is to continue the theodramatic action-the plot of salvation history-in a manner that is consistent with what the Father, Son, and Spirit have already done and are still doing. To some extent, the theologian is a worker in dramatic fittingness whose task is to help us understand the drama of redemption, both theoretically and practically. We need practical understanding of the gospel so that we can speak and act faithful and orthodox lines in new cultural scenes. It is by seeking to live by the word in the power of the Spirit that our imaginations become sanctified. I need a sanctified imagination as I seek each day to improvise my life to the glory of God. There are only five documents in the New Testament explicitly addressed to individuals (Luke, 1-2 Timothy, Titus, and Philemon). The remaining 22 documents are clearly written for various communities. More often than not the pronoun “you” is in the plural in these documents. These documents are unified in their purpose to exalt the crucified and risen Christ, foster the faith of the church, and secure the loyal obedience of his chosen people. Obedience, faith, growth, and maturity are all found in a communal context in the New Testament. Individual obedience is possible and meaningful only when it is located in the realm of community. Ephesians 4:11-16 is a key text in this regard. Read it and notice how the language of obedience, growing, and maturing are all set squarely within the context of the church. The question is not only, am I obedient? 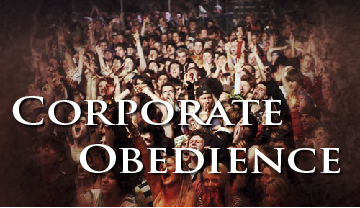 Are we obedient? Martin Luther had some profound thoughts about the process of transformation we undergo as sinful men justified before God and indwelt by the Holy Spirit. He said “to progress is always to begin again.” The Christian life is about grasping the gospel with ever increasing strength and confidence (1 Cor 15:1-3, Col 1:21-23). The Christian life is a life of repentance precisely because we fail to cling to the gospel and allow it to work its way out in our lives. We are deeply fractured and sinful. We stand in constant need of grace. Our lives are patterned by falling and getting up, stopping and going, sinning and repenting, doubting and trusting. It is really not about how much we fall so much as it is about how many times we get up afterwards. As the japanese proverb says, ‘fall seven times, stand up eight.’ Not far off from a Proverb I know (Prov 24:16). This is what grace and forgiveness are about. We stand in need of cleansing and a fresh start again and again and again and again. I think this is the idea behind Luther’s understanding of progression. True growth and progression is revealed in a pattern of beginning again and doing it again and again. The Spirit indwelt man is a fighter and therefore he keeps getting up no matter how many times he has been knocked down. This getting up again and starting anew by running to the gospel—this is progression. This perception of growth is extremely helpful because it is extremely realistic. It is no triumphant onward and upward garbage that no one ever actually experiences on this earth. It connects to real life and places desperation for the gospel at the heart of growth. Gerhard Forde, a Lutheran theologian, fleshes this out in his discussion of sanctification. He says that “sanctification is the art of getting used to justification. There is a kind of growth and progress, it is to be hoped, but it is growth in ‘grace’ a growth in coming to be captivated more and more, if we can so speak, by the totality, the unconditionality of the grace of God. It is a matter of getting used to the fact that if we are to be saved it will have to be by grace alone. I’m reading a helpful book by Richard Hays called The Moral Vision of the New Testament. I just finished reading a section on the gospel of Mark. In it Hays argues that Mark included all the stories of the disciples screwing up, falling, and failing for our encouragement.I couldn’t agree more! We are broken disciples that offer fractured obedience to Christ. When we see the ignorance of the disciples, the stupid things that come out of their mouths, their naps during prayer time, their betrayals, and their denials—if we are honest we relate and we find ourselves relieved that these men are so weak. Their has never been a breed of super disciples only weak and frail followers dependent upon the grace of Christ. When we look to the twelve we realize that we are in good company. We can thank Matthew, Mark, Luke, John, and ultimately the Holy Spirit for giving us the uncut version of their lives of discipleship.